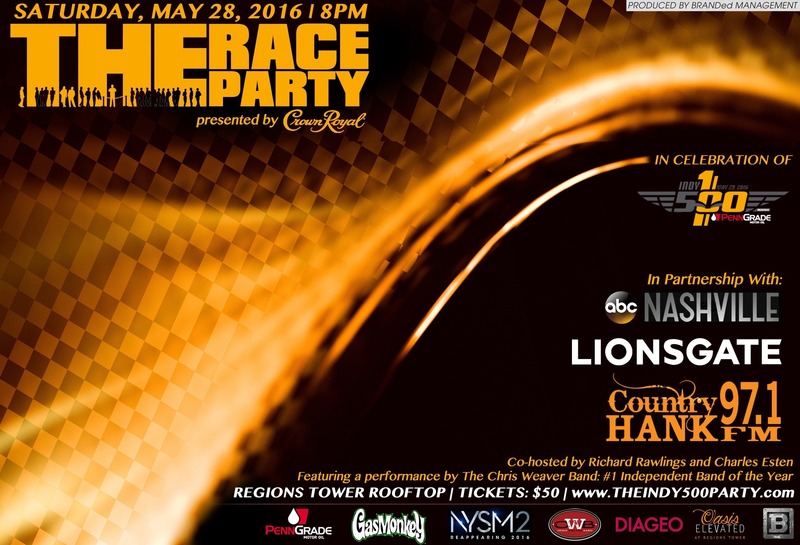 The Race Party Presented by Crown Royal in association with PennGrade Motor Oil, Lionsgate (Now you See Me 2), and ABC's Nashville will feature more than 20 celebs from Sports, Music and Entertainment. This will be a party you won't want to miss!! Join Co-Hosts Richard Rawlings from Fast and Loud / Gas Monkey Garage and Charles Esten, star of ABC's Nashville along with Tucker Beathard, (Opening for Dirks Bentley Tour), Mike Mills (REM), from Storage Wars Barry Weiss, Kenny Rogers, Actor Goran Visnjic (ER, Girls with the Dragon Tatoo), Akbar Gbajabiamila, host of American Ninja Warriors, Actor Dean Norris, Cleveland Browns Spencer Drango (NFL Rookie just drafted), from the Colts Pat McAfee, Le'Raven Clark, Joe Haeg, Dwayne Allen, Ahmad Bradshaw, Darius Butler, Jarrell Freeman, Stephen Morris, Josh Robinson, Hugh Thornton, Jack Mewhort, TY Hilton and Frank Gore, and from the NBA Eddie Gill and Robbie Hummel. The party will kick off the night with a performance by the #1 Independent Artist of the year, The Chris Weaver Band, from Nashville Tennessee! The Chris Weaver Band is coming off an International Tour in Brazil after playing at the Kentucky Derby and cannot wait to play for ya'll in Indianapolis! In an interview with Blake Shelton after his first season on the Voice when asked: "What do you like to do in your free time? ", Blake responded: "I love going out to watch musical performances at live venues like The Stage or Tin Roof on nights when Chris Weaver is playing!" THE RACE PARTY presented by CROWN ROYAL premiered during the Indianapolis 500 in 2005 and over the years has included celebrities such as Anna Nicole Smith, Patrick Dempsey, Chris Judd, Jeremy Renner, Peyton Manning, Mark Ballas, Derek Hough, Ludacris, Gilles Marini, Nick Lachey, and so many more! BRANDed Management has also brought in celebrities for the Indy 500 including, LeAnn Rimes, Mark Cuban, Jordin Sparks, and more. Who's coming this year? Well you'll have to follow us on Twitter to find out! We can tell you it's a great cast from movies, film, music, sports and entertainment and you won't want to miss you! Follow us all month as we release details!